Capital Gains Tax do you have to pay on sale of property? CAPITAL GAINS TAX red Rubber Stamp over a white background. Capital Gains Tax (CGT) is a tax levied by the federal government. It is basically the profit you make by selling your property. So basically, it is only the seller who pays CGT. In Finance Act 2017, CGT was divided into three slabs for calculation of taxes, so the later you sell it, the less tax you have to pay. The primary purpose was to tax businesses dealing in property, but not the normal sale and purchase of property by genuine buyers, since for them selling or buying property basically amounts to a necessity. 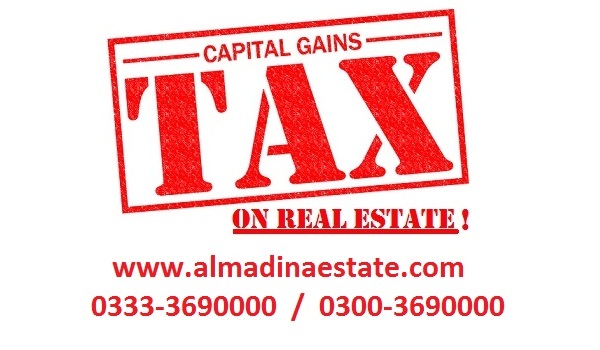 When the seller makes profits on selling property (capital asset), it is the profit (capital gain) which is taxed, hence the name. According to the Finance Act 2017, CGT is levied only when the property is sold within three years of its purchase. The rate of taxation is 10% for the first year, 7.5% if sold during the second year, and 5% if sold during the third year. Previously, these gains were to be calculated according to the fair market value, based on FBR’s valuation table. However, since now the in the Finance Act 2018, under Budget 2018-19, the government has abolished the FBR rates and the valuation tables, now FBR is to be calculated on the declared value. Any property held for more than three years will not make the seller liable for payment of CGT. Plots allotted to army officers and families of martyrs of defence forces are exempted from the CGT. How to calculate the CGT you have to pay? It should be noted that if you have no profit, or you are selling it at a loss, you are not liable to pay CGT in any case. For example, you bought a property for PKR 3 million, but had to sell it at PKR 2.7 million. You actually lost PKR 300,000, so you don’t have to pay any tax. if you used DC rates or even FBR rates as the valuation of your property when buying it, however, the case will be different since the actual value of property is different from DC or FBR rates usually. For example, when you bought it, the DC rate of the property when you bought it was PKR 2 million, while the actual value was PKR 3 million. Now when you are selling it eight months later, the actual value stands at PKR 3.5 million. Your actual Capital Gains stand at PKR 500,000 but your purported profit stands at PKR 1.5 million. You will have to pay taxes on the capital gains of PKR 1.5 million. That is 10% of 1.5 million, equalling PKR 150,000. This difference may be even more pronounced in some cases, where the difference between actual value and DC rates or FBR rates is larger. This may result in you effectively giving away almost the entirety of your profits as CGT. However, you can no longer afford to disregard not declaring the proper value or at least half that value. Since, after the FBR’s Directorate of Immovable Property is established, under-valuation of property may result in government being able to buy your property off you. The new tax regime was just launched after the Budget 2018-19, and that’s when the FBR rates were abolished as well. Moreover, the government has yet to announce the formation of Directorate of Immovable Property, which will set a number of new tax measures in motion, a considerable amount of confusion exists in the property market and situation will become clearer over time. You can be sure that we will keep you updated as they do!